I run. I’m running. I’m a runner. One of my friends Becca ran her first race this past weekend. She was running in honor of her Mom. Student Life had a post Becca wrote prior to the race that I found today. Thought it was another inspiring word for the first day of starting our week. You can read it here or I’ve posted it for you as well! 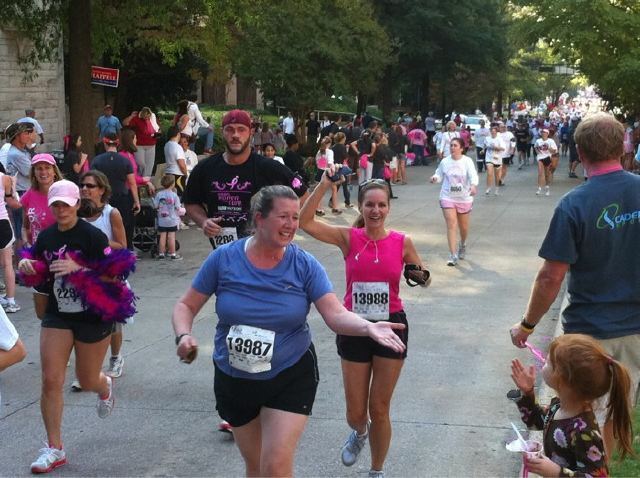 Race for the Cure is this Saturday in Birmingham. I’m running part of it. I’ve never run a race. I don’t consider myself a runner. I actually believed my whole life that I was a non-runner. I’ve watched friends train for half-marathons and seen lots of SUVs with 26.2 stickers on their windows. Go for it! If I was a runner I’d do it too. But I’m not a runner. You might be like me and grew up holding on to things that were never meant to stick to you. Maybe some of them you picked up from your parents. Some were told to you by well-meaning teachers or youth ministers. Some of it you even just picked up on your own. And you got it wrong. And no one ever meant for you to believe those things about yourself or how God feels about you. But you got it. And it stuck. And now it’s truth to you. I did that. I’m a good, old-fashioned Israelite. I love rules. Knowing the rules. Telling others about the rules. But I most of all love following the rules. It gives me a sense of completion. Accomplishment. Do your quiet time every day, be kind, serve others, lead a bible study, be on Student Staff for 12 years, invest in youth workers, etc. All great things! But all a part of my rules so God will know I’m really serious about being grateful for what He’s done for me. He’ll let me mess up a little bit but will always allow me to try again. Because He knows I’m serious. So He’ll know that I am indebted to Him. I want to show Him that I love Him so He’ll know that it’s okay that He loves me. Yeah, I’ll try hard so He’ll know that I’m okay that He loves me. So this summer the Lord said “why don’t you run?” And for the first time in my life I thought “Why not?” I’m watching 350 lb men on The Biggest Loser do it. So I didn’t grow up running. Does that mean I’m physically unable to do it? Or have I just told myself all these years that I couldn’t. Because I wasn’t skinny enough. Or athletic enough. And the Spirit really dug into my heart and said Becca, you used to think that way about God too. That you weren’t good enough. You didn’t try hard enough. You always fell down. And now you don’t think that way anymore. Now you know that God loves you at your core. It’s changed you. Your marriage. Your parenting. Your ministry. So it’s race week. This year marks 5 years since my mom passed away from breast cancer. It will be an emotional day to remember her legacy. But Saturday is most of all for me a spiritual marker. Time to set out some stones and say this is who I was. And this is who I am now because of the love and grace of Jesus. I’m not who I always told myself I was. I run. I’m running. I’m a runner.